Aachen, Germany – The Hermès U.S. Show Jumping Team climbed from behind to secure a silver medal tie with Switzerland in the FEI Nations Cup at the World Equestrian Festival CHIO Aachen in Aachen, Germany on Thursday. A podium finish depended on clear rounds from Olympic team gold medalists McLain Ward and HH Azur and Laura Kraut and Zeremonie. Like clockwork, the combinations came through in the clutch for double-clear performances. The U.S. and Switzerland ended on eight faults while home country Germany won gold with zero faults. The U.S. found itself out of podium contention early with an eight-fault total after the first round. Clear rounds from Olympic team gold medalist Laura Kraut (Royal Palm Beach, Fla.) and Zeremonie, Old Willow Farms’ 2007 Holsteiner mare, and Ward (Brewster, N.Y.) and Double H Farm and Francois Mathy’s 2006 Warmblood mare kept the U.S. hanging on after Rio Olympic team silver medalist Kent Farrington (Wellington. Fla.) and Gazelle, his and Robin Parksy’s 2006 Belgian Warmblood mare, and two-time Olympic team gold medalist Elizabeth “Beezie” Madden (Cazenovia, N.Y.) and Coach, Abigail Wexner’s 2008 Holsteiner gelding, each had eight faults. Tied for fifth with The Netherlands, the U.S. team rallied for an improved second round. 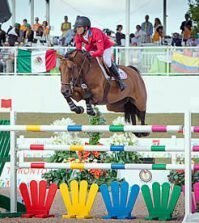 The world number one ranked show jumper, Farrington, and Gazelle, rebounded with a clear round. Kraut and Zeremonie continued with a flawless, second round performance, jumping a double clear for the evening and allowing the U.S. to drop Madden and Coach’s eight fault score. After three combination rotations, Germany locked up the gold, while the U.S. sat tied for third with Belgium and Switzerland with eight faults. Ward, the world number two, and Switzerland’s Steve Guerdat came through with clear rounds, while Belgium’s Gregory Wathelet had three unlucky rails for 12 faults, propelling the U.S. and Switzerland to a silver medal tie. 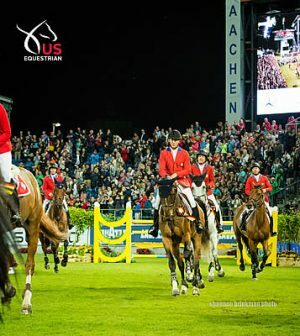 “Aachen is the pinnacle of the sport so this is like my Olympics this year. 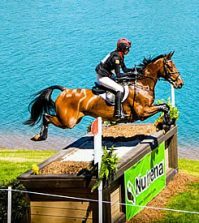 To go double clear – I’m just so proud of Zeremonie and all the team around her who helped get her to this point; it’s just thrilling,” said Kraut.